Mouth care is very commonly neglected in people with life-limiting illness and in the elderly and frail. However, people with life-limiting illnesses, the treatments required to manage them and the medications used for symptom management, have significant effects on the mouth. 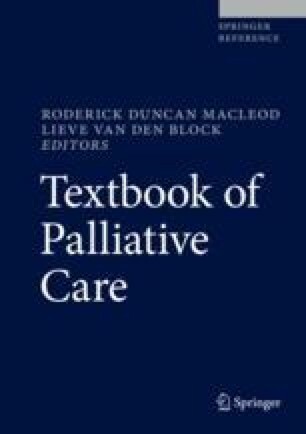 The focus of this chapter will be on good oral assessment and care of the mouth in order to maximize quality of life, maintain self-esteem, feelings of well-being and comfort at the end-of-life. The compartmentalization involved in viewing the mouth separately from the rest of the body must cease because oral health affects general health by causing considerable pain and suffering and by changing what people eat, their speech, and their quality of life and well-being (Sheiham 2005). Oral Assessment Guide (OAG): For use in acute care settings and rehabilitation settings. Anderson P, et al. Oral health problems in elderly rehabilitation patients. Int J Dent Hyg. 2004;2(2):70–7. Brief Oral Health Status Examination (BOHSE): Has been validated in long-term care, residential aged care, and can be used with people with cognitive impairment. Kayser-Jones J, et al. An instrument to assess the oral health status of nursing home residents. Gerentologist. 1995;35(6):814–24. Oral Health Assessment Tool (OHAT): Can be used in long-term care and is suitable to use with people with cognitive impairment. Chalmers J, et al. The oral health assessment tool – validity and reliability. Aust Dent J. 2005;50(3):191–9. The Holistic and Reliable Oral Assessment Tool (THROAT): Developed and tested in elderly hospitalized patients. Dickinson H, et al. The development of the THROAT: the holistic and reliable oral assessment tool. Clin Eff Nurs. 2001;5:106–10.